SAN DIEGO, CA— IT Brand Pulse, a trusted source for research, data and analysis about data center infrastructure, today announced the results of the recent IT brand leader survey covering Cloud, OpenStack & Networking products. 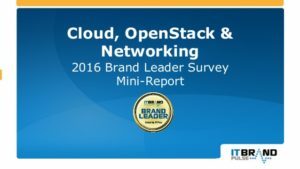 After nearly a decade of IT Brand Pulse brand leader surveys, OpenStack made its debut in the September IT pro voting. Among the four included OpenStack product categories, a single vendor walked away with a sweep of all leader titles in three. For OpenStack Service Providers, Rackspace picked up the Market, Price, Performance, Reliability, Service & Support and Innovation leader awards, ahead of IBM and HPE, overall respectively. Rackspace secured Market, Price, Performance, Reliability, Service & Support and Innovation leadership in OpenStack Services. IBM took second and Mirantis, third, across the board. Continuing to be at the top of respondents’ minds for OpenStack, Rackspace earned all six leader titles—Market, Price, Performance, Reliability, Service & Support and Innovation—for OpenStack Training. Mirantis collected the all-around runner up with Red Hat, in the number three spot. For the second year in a row, Palo Alto Networks paved the way as Market, Performance, and Innovation leader and this time around added the Reliability and Service & Support awards. Dell SonicWall kept Palo Alto from taking Price Leader. Cisco finished next in line for Market Leader with F5 in third. Climbing out from a second-place showing in 2015, Palo Alto Networks was chosen Market, Price, Reliability, and Service & Support leader in this year’s survey. F5 (Market Leader runner up) broke apart the complete victory by being selected both Performance and Innovation leader. VMware snagged the overall third place. VMware AirWatch® emerged as the Market title-holder for Enterprise Mobility Management and led the way as Price, Performance, Reliability, Service & Support and Innovation leader. Microsoft and IBM went two and three as Market Leader. In a field crowded with sixteen vendors vying for leadership titles, IT pros flipped their perceptions in 2016 tapping Riverbed as Market, Price, Performance, Reliability, Service & Support and Innovation—moving the past champ, Cisco, down to number two Market Leader (ahead of F5). With six brand leader distinctions (Market, Price, Performance, Reliability, Service & Support and Innovation) up for grabs in NoSQL Database Software Distributions, MongoDB scored big by receiving all of them. Oracle and DataStax Cassandra rounded out the top three Market Leaders, accordingly. Mellanox commanded Market leadership for the third year along with Performance, Reliability, and Innovation honors. Intel, the 2016 survey’s Service & Support leader, placed in the number two Market slot, preceding Cisco. Broadcom was credited as Price Leader. Zadara Storage proved it is still the company to beat for On-Premise Enterprise Storage as a Service, with a replay of its 2015 Market Leader achievement. Zadara also brought home Price, Performance, Reliability, and Innovation awards. Nimble Storage—the second-place Market finisher— interrupted the sweep by earning Service & Support and SoftNAS, the only other competitor, was number three. Although this category was last surveyed in 2014, IT professionals held on to their mindset: For the third time, Cisco swept Low-Latency Ethernet Switches (Market, Price, Performance, Reliability, Service & Support and Innovation). Mellanox was the voters’ second choice as 2016 Market Leader, followed by Arista. Cisco stayed in front of Juniper Networks (voted Service & Support Leader) and Dell SonicWall (Price Leader) to nab Market, Performance, Reliability, and Innovation. Juniper and Dell came away with the number two and three Market positions, in that order. With the acquisition of the two companies complete only one month prior to this 2016 survey, Symantec/Blue Coat carried its cyber-security portfolio to a new level as voters cast their winning ballots for them: Market, Price, Performance, Reliability, and Innovation leader. While Cisco was singled-out for Service & Support, ZScaler slipped in as runner up Market Leader (Cisco was third). Red Hat captured Market, Price, Performance, Reliability, Service & Support and Innovation awards for OpenStack Distributions; garnering the highest Market Leader voting percentage (more than 60%) in the entire survey of fourteen product categories. SUSE and Mirantis were a distant second and third. A.F Ferguson (PwC) – American Airlines – Anthem – AT&T – Averitt Express – Bank of America – Banner Bank – BARC – Boston Scientific – British Petroleum – Caesars Entertainment – Capgemini – Capital One – CGI – City of Los Angeles – Columbia University Medical Center – Cox Communications – CPX – Daybreak Game Co. – Delta Airlines – Detroit Medical Center – Deutsche Welle TV – ELETRONORTE – Ernst & Young – ExxonMobil – FDIC – First Republic Bank – Ford Motor Co. – Geotab – Hetero Drug – Independence Blue Cross – ISRG – ITG Inc – Jockey International – Kaiser Permanente – Lafarge – Library of Congress – Lockheed Martin – Lowe‘s – London Police Service – Macys – Marubeni America – McKesson Corporation – Mentor Graphics – Michael Kors – Milliman – Mimeo – MIT Media Lab – Morgan Stanley – NASA – National Bank Of Greece – NAVNETWARCOM – NCR – Nevada Supreme Court – NIH – NOAA – Norfolk Southern Corp – NYCHA – Optum – PPG Industries – Perrigo – Purdue University – Ricoh – Servpro – Shell Oil – Siemens – Social Security Administration – Southwest Gas Corp – St. Luke’s Hospital – Stanford University – Staples – Swagelok – The J.M. Smucker Co – Thomson Reuters – U.S. Census – U.S. Navy – UPS – USA ARDEC – USGS – Verizon – WESCO & many more..